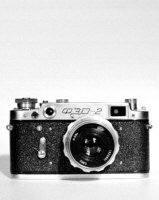 Russian made cameras form a highly specialised field in collecting. Especially the numerous Leica copies are highly wanted and of course Leica copies are usually a lot less expensive than the real thing. Well, things seem to be changing, Gold plated copies with Luftwaffe inscriptions seem to be highly collectable nowadays. Very kitschy indeed. On the other hand we have the heavy Russian SLR cameras, usually made from, and heavy as steel. They mostly look old fashioned and the noises they make can be disturbing but they go on and on and on. Have seen my share of beaten up cameras that still work fine. Big advantage is that many of them that were produced from the 1960s onwards, use the M42 lens mount, making for a huge cheap lens stock. Maybe those lenses are not as good as their contemporaries but they are cheap and not all subjects need tack sharp rendering. Having said that, some are very sharp indeed.